jQuery makes it possible for your code to get an HTML element and do something cool with it. In the example, I’ll show how you can show and hide sections inside your page. But there are plenty more things you can do. In the past you would have needed to write something like this to access a value from a radio button in a group named someRadioGroup. A big part of the appeal of jQuery is that it allows you to elegantly (and efficiently) find and manipulate HTML elements with minimum lines of code. jQuery supports this via a nice “selector” API that allows developers to query for HTML elements, and then apply “commands” to them. One of the characteristics of jQuery commands is that they can be “chained” together – so that the result of one command can feed into another. jQuery also includes a built-in set of animation APIs that can be used as commands. Download it and then include it in the head or body of your HTML page. If your application is online, use a content delivery network to host the files, reference them from your HTML page. You can download jQuery from the jQuery website. And install it in a folder in your app. 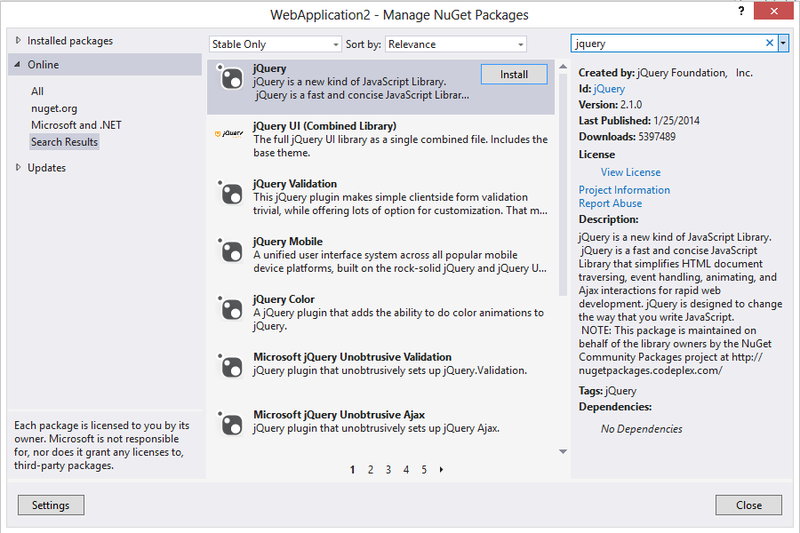 You can include jQuery in your Visual Studio project by using NuGet. To launch NuGet, right-click on the project’s references node and select the Manage NuGet Packages option. This launches the Manage NuGet Packages dialog. You can search for jQuery in the search box. Note:If you are using Visual Studio there is a good chance that jQuery has already been included as part of the template you used to create your project. Be sure the version has the features you need. You can get it from CDN. Generally it will not matter which to use. Check that the network hosts the library you need. Important Note: If you’re building an intranet application, stay away from the CDN approach. It doesn’t matter who’s hosting it, unless you’re on a very overloaded server internally, no CDN will give you more performance than local 100mb/1GB ethernet will. If you use a CDN for a strictly internal application you’re hurting performance. Set your cache expiration headers correctly and ignore CDNs exist in the intranet-only scenario. The jQuery function searches through the DOM for any elements that match the provided selector and creates a new jQuery object that references these elements. More on that. But first, you need to be sure jQuery is ready for you. jQuery creates the $() alias for you, so you don’t have to type jQuery() every time you want to use it. jQuery offers a powerful set of tools for matching a set of elements in a document. jQuery selectors allow you to select and manipulate HTML elements as a group or as a single element by first getting the element or attribute. What makes jQuery so easy to select elements is its selector engine, Sizzle, and it’s easy syntax, which is based on the same syntax you would use to select elements in CSS by borrowing from CSS 1-3. And then we get its text and show it in an alert. Valid HTML requires that each ID be unique on the page. A page is not considered valid if there is more then one of the same ID on the page. Because of this, jQuery will only match the first element that matches that ID on the page. Note: Selectors return a jQuery object known as the “wrapped set,” which is an array-like structure that contains all the selected DOM elements. You can iterate over the wrapped set like an array or access individual elements via the indexer ($(sel) for example). More importantly, you can also apply jQuery functions against all the selected elements. This means you can continue working with return values. In the following example, The class selector returns elements that you can continue to operate on. In this case, an elements object are returned and then the background color is set to yellow. More complex selectors work the same way, using the same hierarchy as CSS. $(“p”) selects all <p> elements. $(“p.intro”) selects all <p> elements with class=”intro”. $(“p#intro”) selects the first <p> elements with id=”intro”. In the following example, we use assorted selectors and then apply the jQuery css function to the results. NOTE: jQuery will fail silently if there are no elements that match your selection. There maybe a time when you will want to perform some actions based on if an element is present or not in the DOM. To test for an element we use the length property to test how many elements are in the DOM. which would return the links (<a> elements) inside of a paragraph (<p> elements). so just as you would describe elements for styling purposes, you can get those items and then take action. You can narrow your selection by using filters. :nth-child(xn+y) – Matches the nth children based on the formula. Examples: (3x+1) Get the first element after every third child. (3x) get every third child element. jQuery also adds additional pseudo selectors to enable you to narrow your selection further. You can find out more about selectors by reviewing the complete reference Selector category on jQuery API site. :animated – Matches elements that are being animated. :has(selector) – Matches elements that have at least one of the specified matched selector. Learn more about the selectors in the NextechU post CSS3, jQuery Tutorial – Selectors Reference.